Astonishingly, some people are still not convinced about the dangers of climate change, despite frequent reports of extreme weather events, rising sea levels and record global temperatures. Europe in July experienced an extreme heat wave, even reaching into the Arctic Circle. 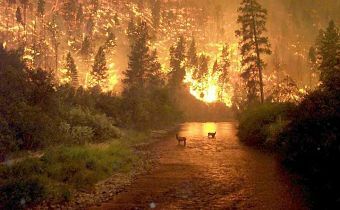 Exceptionally severe forest fires have raged as far north as Sweden. Africa experienced its highest ever reliably recorded temperature of 51.3C in Ourargla, Algeria, on 5 July. And throughout the Middle East temperatures also reached new extremes, with the hottest night ever recorded in Quriyat, Omen, of 42.6C. Record-breaking temperatures have ranged across Russia, India, Eurasia and Europe as well as California and Canada, causing large forest fires. At the same time, Japan has suffered from extreme flooding, followed by a heat wave. It is not just the northern hemisphere experiencing extreme weather. Yet another drought is gripping much of Australia, and our Great Barrier Reef is bleaching, destroying not just one of the most fabulous natural wonders of the world, but a prized tourist attraction which supports tens of thousands of jobs. Meanwhile our governments dither about allowing Adani to open the largest coal and climate-damaging mine in the world. A leaked report of the UN Intergovernmental Panel on Climate Change, due for release in October, warned that keeping the increase in global temperatures to below 1.5C, as agreed at the Paris Climate Conference, would require “rapid and far-reaching” changes. Unless we reduce emissions, the world would exceed 1.5C by 2040, and the impact of global warming would be much more severe. In close collaboration with the climate scientists, Pope Francis is in no doubt about the reality of climate change and highlights our moral responsibility at this time of acute peril. Pope Francis In DC 19. Stephen Melkisethian. flickr cc. 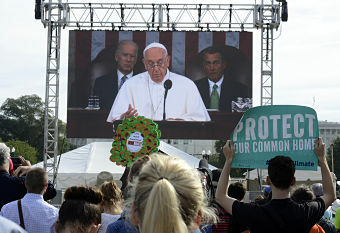 Speaking on 6 July to an audience which included many scientists, economists and climate specialists, Pope Francis reiterated his call for radical change and a profound ecological conversion to save the planet’s life support systems to ward off unprecedented climate collapse. Francis was addressing an international conference marking the 3rd anniversary of his social letter, Laudato Si’, “Saving our Common Home and the Future of Life on earth”. Such a title would seem pretentious at any other time, but indicates the real alarm in scientific and international circles about the effects of severe climate change. Among the nearly 400 participants were representatives from other Christian and religious traditions, international organisations and civil networks. The meeting was organised also to draft action plans for meetings of the IMF and World Bank in October, and the UN climate change Summit, COP24, to be held in Katowice in Poland in December which will assess progress in implementing the 2015 Paris Agreement. Cardinal Pietro Parolin opened the conference warning that humanity is facing a “possible collapse” in the Earth’s ability to sustain life, and Cardinal Peter Turkson also warned that we were “on the brink of an unprecedented global catastrophe”. Among the young speakers to launch the conference was the 17-year-old Australian, Jade Hameister, the youngest person ever to ski both the North and South Poles, and to cross the polar ice cap on Greenland. She insisted we must “act as one species facing an extinction event of our own making”. Other speakers included Patricia Espinosa, executive secretary of the UN Framework Convention on Climate Change and Nicholas Stern, author of the 700-page Stern Review on the Economics of Climate Change in 2006, along with Cardinal Bo from Myanmar and John Zizoulas, Eastern Orthodox Metropolitan of Pergamon. He said that the young will be left to bear the full “consequences of the current environmental and climate crisis”. He also highlighted the need to protect indigenous communities and their traditions, especially when their lands are expropriated and their cultures trampled by predatory schemes and new forms of colonialism. For them, “land is not a commodity but a rather a gift from God and from their ancestors”. Before the Vatican conference, one of the world’s most eminent economists, Jeffrey Sachs, lauded Laudato Si’ as “breathtaking” and “compellingly holistic”. Though not a Catholic, Sachs has been advising the Vatican for 25 years, and played a major role in drafting Laudato Si’. Against conservative US critics , Sachs said that the preparation of Laudato Si’ was “absolutely remarkable”, “bringing the world’s top scientists, climatologists, engineers”, politicians and others into a collaborative process. Acting on overwhelming scientific advice, Francis has been urging all the Christian traditions, in collaboration with people of other religions and non-religious beliefs, to recognise the moral imperative of reducing global warming to avert looming catastrophes.